Access DeDuper by clicking on the tab. 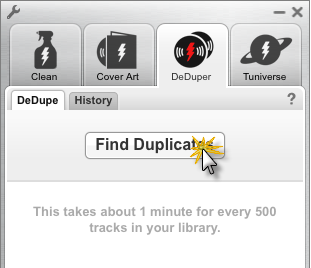 Click the "Find Duplicates" button to begin the search process, and DeDuper will process your library to search for duplicate songs. As stated in the app, it does take about a minute per 500 tracks in your music library. Large collections may take a while, so if you have a large collection, be prepared to let it run for a while. As illustrated in the image below, you can Pause the search if you would like, and there is a progress bar that provides an estimate of how long the process will take. 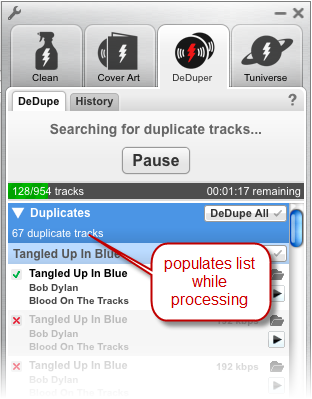 As DeDuper processes your collection, it will populate the list of results as it finds duplicate; however, be aware that since DeDuper is still searching, it may not have found all of the duplicates for a given song even though it is displaying the result. It is best to wait to "DeDupe" until the search is complete.